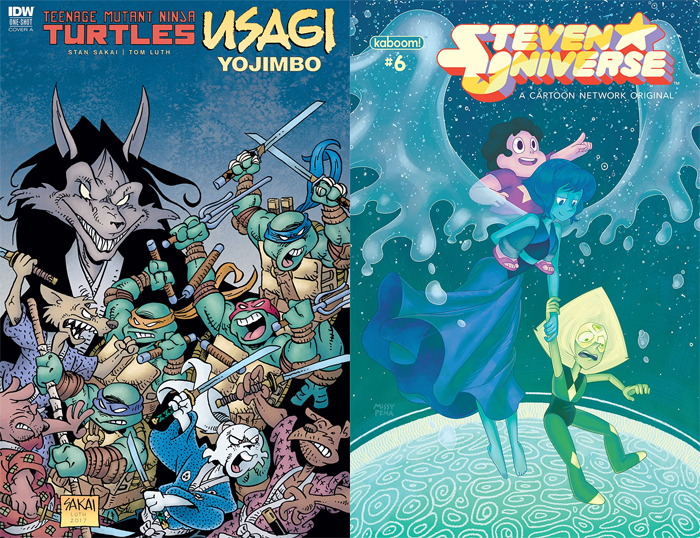 Home »Comics»Deadshirt is Reading: TMNT/Usagi Yojimbo and Steven Universe! While some cross-company crossovers might spark suspicions of a desperate desire to cash in on licensed IP or an exhaustion of ideas, Stan Sakai’s Usagi Yojimbo and Eastman/Laird’s Teenage Mutant Ninja Turtles have a long-standing relationship, dating back to the beginning of both properties’ origins in the black-and-white indie comics boom of the 1980s, with Usagi popping up in TMNT’s toy line and cartoons as well. For that matter, Sakai is a reliable craftsman with over 200 Usagi comics under his belt, not likely to chase a trend. This one-shot’s story fits the Turtles into Usagi’s universe, not vice versa. In TMNT/Usagi Yojimbo, the titular Usagi finds himself drafted by the old mystic Kakera to restore a magical piece of rock keeping a giant catfish imprisoned underground. Kakera summons the Turtles to help him, and together they face off with Usagi’s nemesis Jei and his army of brigands to save the land. It’s a straightforward story, down to the “our heroes fight before teaming up” beat. But, as always with Sakai, the pleasure is in his art and the character beats. Despite Usagi’s world being at stake, the tone of the story is lighthearted adventure, with cheeky nods to continuity (Kakera tells Usagi that this version of the Turtles is from a different but similar reality to the version he knows) and narrative tropes (Usagi rescues a group of pilgrims, who then inform us Sakera prophesied that nothing else notable would happen to them). As always, Sakai’s linework is expressive, particularly when posing the demonic Jei in unnatural postures to emphasize his extraordinary nature. His layouts for fight scenes are energetic and clear, with an initial Leonardo/Usagi fight taking on a slapstick tone, while the climactic battle between good and bad is suitably epic. I’m glad to see Sakai still putting out solid work on a steady basis, and hope that this latest one-shot might bring some new readers to Usagi Yojimbo. 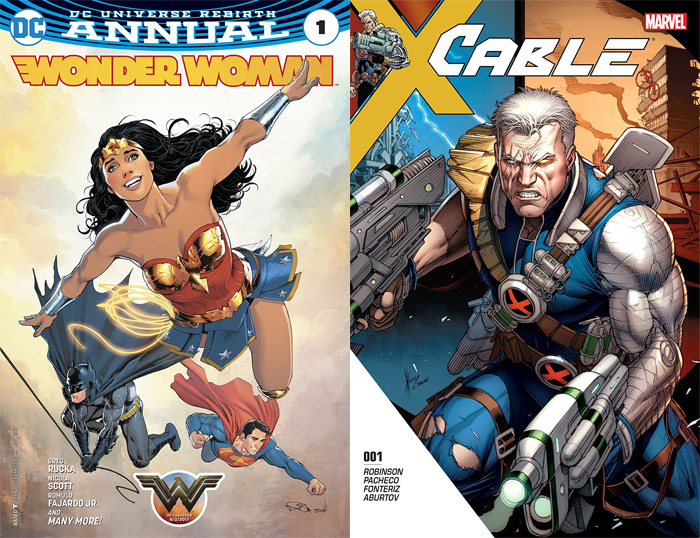 For Steven Universe fans yearning for more after a dramatic “Steven Bomb” and a leaked SDCC trailer, the Steven Universe comic published by BOOM! Studios aims to fill the star-shaped holes in your hearts. This latest issue by Grace Kraft and Rii Abrego is made in the mold of other simple, character-driven Beach City episodes, and centers on Pearl as she tries to burn off some bottled-up frustration. When even some holographic sparring can’t do the job, Pearl finds herself in the ring with Amethyst, re-christened the “Peach Panther” to rival Amethyst’s wrestling alter ego Purple Puma. Grace Kraft pens a cute little story about Pearl’s ever-present need to unwind—and since Pearl’s my favorite Crystal Gem, I ain’t complaining.Tucked inside is a message about how the fastidious Pearl and the messier, more chaotic Amethyst are not as different as they appear, which adds a little weight to the fluff. Rii Abrego’s art is on-model but unfortunately stiff and, combined with Whitney Cogar’s coloring, flat. Considering that Steven Universe‘s animation style leaves room for variation and individual artistic interpretation, it would be nice to see less rigidity in the comic’s art, though much of the humor, like Garnet casually wearing a bomber jacket, still works. Charming and pleasant if ultimately inessential, Steven Universe #6 makes for a cute beach read.